Are Christians Being Persecuted During the Christmas Season? One more from JWB! How right Tim is! Oh noes! It’s a war on Christmas! The cups have snowflakes on them this year. Nowhere in the Bible does Jesus even demand his birthday be celebrated (which isn’t his actual birthday anyway). Christmas wasn’t celebrated by the early Christians. Some Christians have even opted out of celebrating Christmas because of how commercialized and secular it’s become (and I’m not just referring to Jehovah’s Witnesses). It’s becoming an increasingly common thing. It’s hard for me to wrap my mind around people getting all bent out of shape because some throwaway coffee cups don’t have holiday oops — Christmas, decorations on them. What the heck do snowflakes have to do with the birth of Christ, anyway? There was no snow in Bethlehem or the desert around it. There certainly weren’t any reindeer or coniferous trees. Jesus wasn’t born in Scandinavia or Siberia (where you might expect to find those things), or even central Europe. My point? Snowflakes, reindeer, Santa Claus, Christmas trees — those are all purely secular. How is their absence on everyday objects proof of Christian persecution? You tell me. Silly things like coffee cups, or saying “Happy Holidays” instead of “Merry Christmas” are NOT persecution. How come 40 or 50 years ago, people could say “Seasons Greetings” or “Happy Holidays” and no one batted an eyelash? How come Jews don’t get all sulky even though most of us aren’t going around saying “Happy Chanukah” and there have never been little dreidels or Stars of David printed all over disposable coffee cups? Thanksgiving is behind us and the Christmas season is now officially underway. Do you know any Christians who feel persecuted by others during this season? 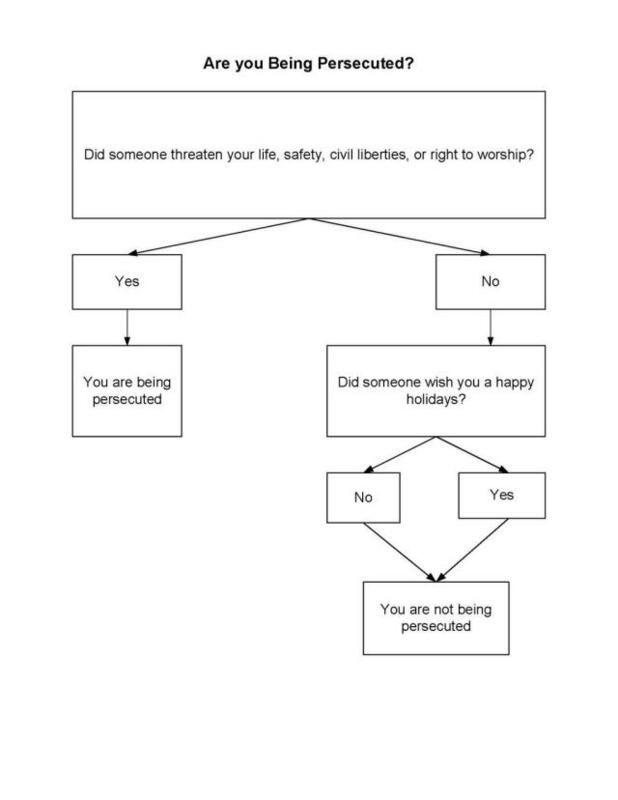 Here is a simple chart you can share with them to determine whether or not they really are being persecuted. I got it from another blogger and this is the fourth year I have posted it. I think the analysis still applies. This entry was posted in reblogs, Uncategorized and tagged celebrating Christmas, Christianity, Christmas, Christmas decorations, Jesus Christ, Jesus Without Baggage, persecution of Christians, War on Christmas by luckyotter. Bookmark the permalink. excellent poster there.I am seriously considering stealing it from you and posting it on everyone’s fb page that whines this season. Thanks for the reblog, Lucky. I have seen a good bit of activity from it on my blog. By the way, I love your graphic; I am borrowing it to use next year. How about that Starbuck’s cup controversy last year. That was a real hoot! Which graphic? The cartoon? I lol’d when I saw that, just had to add it! I agree the Starbucks controversy had me shaking my head and rolling my eyes. Yes, the cartoon. I like it a lot. You are wrong about one thing. Jesus was obviously born in Europe. Can’t you tell that from his blue eyes, long brown hair and fair skin. You obviously haven’t seen his pictures.